The most recent posting from Girlie On The Edge ( see blogroll ) muses on the positive effects of old libraries on its patrons. This brought to mind a nice post-length story that I’ll put up here, rather than clutter up someone else’s ‘comments’ section. And here’s a sequence of links that may serve in way of explanation; pepperoni- Ward Bond- Wagon Train- Clint Eastwood– Rawhide- Wednesday nights as a kid- Wednesday afterschool trips with Dad to local library-favorite book at said library. Wednesdays at about age 8 or 9 stand as one of the better childhood memories for me. The afternoon trip to the library, followed by a stop at an Italian bakery for bread; then home, for Wednesday spaghetti and meatballs. After supper, two handmade pizzas ( with pepperoni, apparently the only pizza topping that was allowed in the early 60’s ); to be consumed while watching Rawhide ( the really cool western ) at 7 pm, followed by Wagon Train ( the not-so-much western ) at 8 pm. So… four hundred years later, if I have a bite of pepperoni…voila Ward Bond. And the truly odd thing is that I didn’t like Wagon Train or Ward Bond nearly as much as Rawhide with C. Eastwood. Go figure. So anyway…that’s how my brain gets from point A ( pepperoni ) to point I ( the library ). 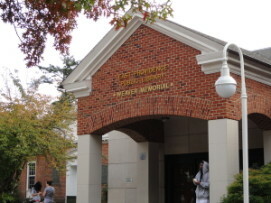 The Wednesday library trips ( initially to the Rumford branch ) eventually led to trips to the larger Weaver branch on the far side of town ( East Providence, Rhode Island ). At the Weaver branch, I had a few perennial favorites that I would take out as often as I could. At age 8, I firmly believed that you would get in big trouble for taking the same books out too often, so I cannily signed them out every other trip. I was sure that the local authorities would never catch me; the perfect crime. My absolute favorite was a book about medieval stuff and knights, very well illustrated; it was the illustrations that did it. I got this book as often as I could, and even tempted fate with consecutive uses. ( Life in the fast lane, circa 1960 ). Things were going along pretty well. Wednesdays were great; my favorite book, trips with Dad, pepperoni pizza…and Rawhide. Some other kid had gotten my book from the library. It wasn’t in its proper place on the shelf. I fervently asked my dad to assist… he asked at the librarian’s desk…and it was confirmed. Gone. In the hands of some infidel…some agent of evil…some other kid. The next day at school, I slyly scanned everyone’ s books to locate it. It had to be one of them. Under my breath, I called them bastards, defying the powers that be to stop me. In those days, you could challenge authority under your breath. Of course, if my Mom heard that, I’d be looking like Mussolini on a lamppost by sundown, so one had to be careful. This was serious business. The librarian had assured us that it would be back. Overdue rates went into effect after two weeks; a crippling 3 cents a day. No kid could bear up under that. Not even a kid with an allowance or a big kid with a paper route. I just had to be patient. The powers that be seem to revel in the angst of the 8-yr old; patience was not granted, and the book did not appear on the shelf again for over three weeks. When it finally did, I of course seized it immediately, vowing that they would never get it again. I had to think of some way to deny the bastards access. Once and for all. I contemplated, and committed, a capital offense. And one day, at age 40-something, I read in the news that the Weaver branch was being re-modeled. I found this a bit worrisome; a modern addition would be acceptable, but surely they wouldn’ t consider threatening the core? The quietest place on the planet Earth? The part that generated the smell?? Demolition??? Well after the project was completed, I went there. In great apprehension, I entered the alcove. It had been changed. Glass doors had been added. A whole modern wing had been added, too. The main circulation desk had been moved. And worst of all; it smelled all wrong. But a little further in… the archway to the left of the alcove was still there. And beyond that…the children’s section. Completely untouched. I walked through the archway, feeling a vague sense of embarrassment, as if an adult should not be allowed there without a child in accompaniment. And…quite precisely then, as if from some remote primordial cue, my inner 8-yr. old saw his chance. Find the book! I could not remember the exact spot on the shelves. I did not even think it possible, but luckily the 8-yr. old did. I could barely remember what it looked like, or what the title was. And yet the 8-yr-old was persistent; he would have his way. He had waited this long. The bastards were finally going to pay. And after a ten-minute search…there it was. Simply titled “Knights”, published in 1953. The title didn’t trigger the really deep memories; it was the illustrations. Timelines crashed together like the light-sabers from Star Wars. And while standing there enjoying the spectacle, the pure sensation of time-traveling…the 8-yr- old found a way to remind the adult that the bastards had already paid! Don’t you remember?? The adult laughed out loud at the memory. The timelines were swirling around like a tempest; he remembered just how the crafty 8-yr old had found a way to mark his territory forever after. In the lower right-hand corner of every other page…he had written the initials “RC”…in what seemed to be microscopic print to him ( to avoid detection by the authorities ) but were actually letters about a quarter-inch high. Meant at the time to act as a warning to other kids, to frighten them off…and it seems to have worked?? It hadn’t been checked out in the last 11 years. And his 1960- dated stamps were still on the card. He put the book back in its place. He wouldn’t dream of taking it. It was safe and secure, protected by the talismanic initials. And on the way out, he wondered…the boy had magically saved the book…but had he somehow saved the library, too? And now, after even more years…I think it’s about time to run by the Weaver branch…see how thing are. Yours truly+a long stressful workday+moderate consumption of alchohol+extraordinarily annoying relatives+McDonald’s fish sandwiches. 2 for $3.33. That’s how that happened. I remember a time when I actually liked the damned things. But they’ve changed (much for the worse ), and so have I.
So… McDonald’s and a tall Pilsner glass of Blue Moon with orange…followed by a meaningful exchange with the Guardian of the Seventh Ring of Hell ( a sister-in -law; the one whom Slayer has been writing odes of adoration to for all these years now ), and then off to dreamland. Normally a very self-servingly pleasant place, Dreamland can occasionally turn on you like your neighbor’s pit bull who finally slips his collar and decides to show the back of your leg who really runs things around here. And on last night’s roster; a double billing. Just awesome. The Opener; We begin with agonizing, bone-breaking leg cramps; followed with heartburn, much similar to open-heart surgery, except you couldn’t afford the anesthesia. ( AlliedBarton employee benefits leave much to be desired…) As the haze clears and the yelling subsides…. I’m an armed guard stationed outside of a hospital room. I’m charged with preventing the forces of evil from getting to Pat Benatar? ?, who is slated to do a show for the hospital patrons. Other than standing around feeling the general dread of the forces of evil and wondering why I can’t be guarding Emmylou Harris or Diana Krall, not much happens here. And, as always, my heroines are fully and tastefully clothed. Great. I am such a boy scout. The Main Event; Nine! Count ‘Em! Nine! Apparently, Dante Alighieri was right. There are ten rings of hell in total, and not counting the last one ( you wouldn’t ever be leaving there ), there are actually only nine to be concerned with. Ask me how I know. Just go ahead, ask me. What’s it like if a boy scout goes to hell? It ‘s not bad, really. Not at all. Very quiet. Almost too quiet. An upscale Lucifer in an Armani suit stands in the entrance of my underground earthen chamber. There’s a gorgeous roll-top desk in the center of the room, with a very bright halogen lamp to illuminate it. A very nice red leather office chair; a tin cup and an old wooden canteen hang from a peg on the wall. Barring the appearance of a scantily-clad heroine, not bad at all, I would say. 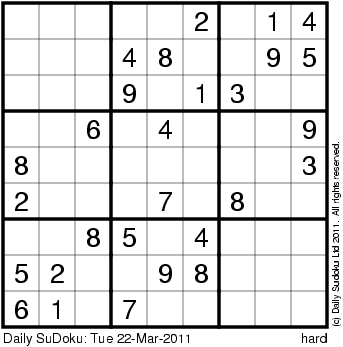 There are nine sudoku puzzles on the desk. ( I’ve been slightly obsessed with those lately.) My polite and well- mannered Lucifer instructs me that I’m not stuck here forever, just before he leaves. All I have to do is solve the puzzles. Solve a puzzle, move up a ring. Nine, and counting. Dante was right. That does it. From now on, it’s KFC. 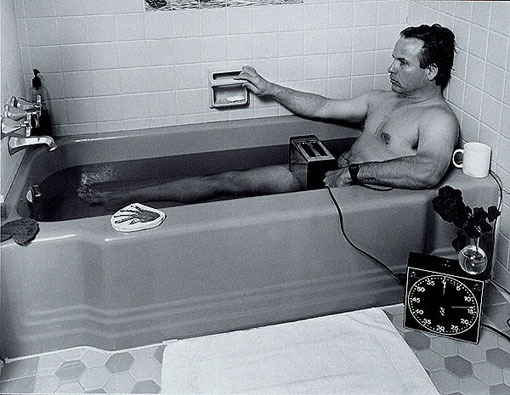 Sorry about Pt II being so tardy; I’ve just managed to get the toaster out of the bathtub, and must reach over to hit the ” publish” button. Very brisk, I must say. A human sits outside in a pastoral natural setting; and has absolutely no external awareness on any level. He suddenly becomes instantly aware of the immediate environment, but does not interact with it in any way. His awareness of the environment is purely observational and neutral in nature…then he reaches down and picks up a stone. At that precise moment, the decision to interact with and manipulate the environment was made, and control was exhibited; defined as the simplest level of interaction with an environment. Now… was that inception of control already infused with any delusion/illusion? I submit that anything of that sort is subjective in nature, and therefore must occur after the fact. This also brings to mind a personal anecdote. Years ago, my wife agreed to watch our niece Olivia during the days while her parents were working. Olivia was just three months old. I was not terribly supportive of the idea to begin with. On her first day in, her mother arrived with a baby and a huge bag of baby stuff. She was in a hurry, so she dropped the bag, handed me the baby, and left. I was very inexperienced, and it was some minutes before Sandra was available to rescue said baby from said baby rookie. But in that few minutes, some extraordinary things happened. Olivia was fast asleep for the first few minutes that I was holding her, and she woke suddenly. She was understandably distressed. So was I. There was a radio playing in the background; Bon Jovi doing a Christmas song ( Jingle Bell Rock, if memory serves. ) And while Olivia was looking at me and crying ( and I looked back at her and tried not to ), she suddenly became aware of the music. She stopped fretting about and froze in place, mesmerized by Bon Jovi. And I got to witness a small sequence of momentous events. At this point in Olivia’s brief life, she knew four things for sure. She knew about food, she knew how to make noise, she could see, and she could touch. Listening ( or maybe it was just Bon Jovi?) was apparently a brand new thing, and I got to watch as she sorted it out. Her first response was to look to both sides as far as she could ( just a few inches, from one side of her blanket to the other ); then, she held her hands in front of her face and wiggled her fingers a few times; and finally, made the suckling motion. She hesitated in between each step, as if waiting for something to happen. I have since realized that she was categorically comparing the new thing to her short list of verifiable experiences. Having determined that the new thing was not food, not touchable, and not visable either ( and presumably of no immediate use ), she listened again for a few seconds. She glanced again at me ( double-checking to make sure that I wasn’t involved somehow), and then, having apparently decided that a) the new thing could wait, and b) the new guy was OK, she promptly went back to sleep. I had just witnessed a three- month- old use her complete range of experience to make deductions about new factors in her environment. I had witnessed a process of pure deductive reasoning, without external assistance and without language. Olivia had expanded her environment by using all the tools she had at hand. And her deductions were correct; the new thing was not touchable, viewable, or edible. She had, entirely as a result of her own process, determined that Bon Jovi could wait and that the new guy could be trusted. So Olivia exhibited some pretty impressive control over her very small environment, and managed to turn a baby rookie into a lifelong supporter in five minutes flat. Not too shabby.